This looks like a lot of fun; riding a tilting electric cargo trike in the snow…..and doing donuts! In the following video Butchers & Bicycles from Copenhagen demonstrate how their e-cargo trike handles in the snow. Speaking of snow and e-bikes, here is a video of the Pedego Interceptor e-bike with Schwalbe studded snow tires! “Your new car? The cargo bike with some electric assistance.” In this article, the author talks about his experience of going car free and using an electric cargo bike with his family in London. Here is an article about Defiant Bicycles, who specializes in “fat” electric bikes. It is a good article about the company and riding “fat” e-bikes in the snow! City Car Share in San Francisco has just added A2B and Juiced Riders electric bikes to their electric vehicle fleet! The Haibike XDURO NDURO electric mountain bike has won the iF Design and Innovation award! This NDURO is a full suspension mountain bike that uses the Bosch mid drive kit with many high quality mountain bike components. Pedego’s Trail Tracker “fat” electric bike has just been launched in the Europe. In addition, Pedego has partnered with Bikeboards to provide a front wheel ski option for riding the Trail Tracker in the snow. Cheapism.com recently recommended several electric bikes as a cheap alternative to driving a car. I totally agree! Riide is a new electric bike making a splash on Kickstarter with their new simple and lightweight electric bike. 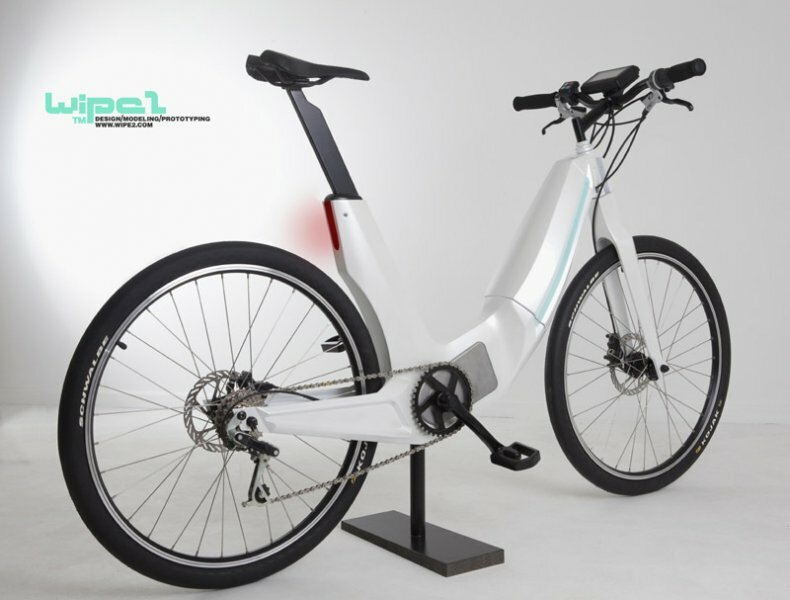 This is a concept electric bike called the E-Bike Element. The bike features a Daum mid drive motor, a step thru frame made from two stamped aluminum surfaces, and an integrate battery on the downtube. The VeloMini III ultra portable electric bike was just in for review. Here is the first part 1 of the review with a video, a bunch of pictures and the specs. And part 2 of the VeloMini review has ride characteristics, range test results, pros, cons, and overall thoughts. Great title “The most impressive vehicles at the Detroit auto show are bicycles“. It sounds like the new Smart electric bikes will be available in the US at Mercedes dealers this spring. That’s it for now. Stay tuned for more e-bike news and reviews! I like the the electric trike. This would go well in selling it to people who do not want to ride a traditional bicycle, but want to carry groceries home from the store. The article on green tech is very useful and I will use it to spread the word about ebikes in my area in Northern California. Thank you Pete for providing this great information.